We finally got the chance to meet up. Classmates during secondary school days but we were never close to each other. In fact, to quote Tallin, we were pretty hostile towards each other. Maybe it was because of the group of friends that we had. 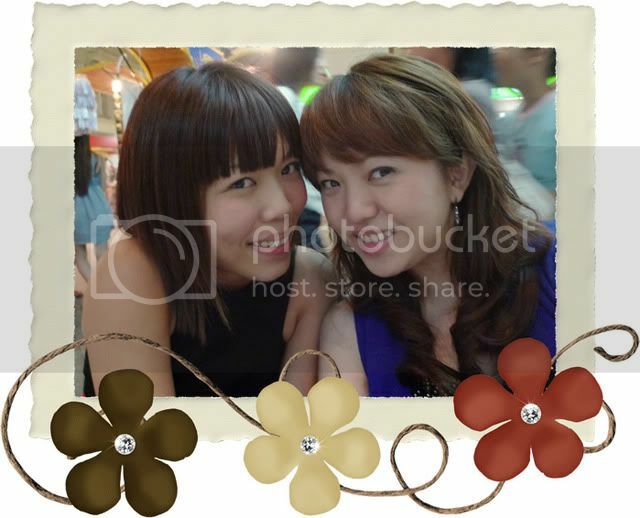 Some years back, we found each other in Friendster. But we didn't really kept in contact back then. Just the occasional checking of each other profile. Then came Facebook and we didn't bother with Friendster anymore. And so, we lost contact with each other once more. Some weeks back, we found each other on Facebook. This time round, Tallin sent me a message to arrange for a meet-up. I was quite surprised by her suggestion, but I agreed to it. 12 March 2010, we arranged to meet for dinner at Bugis. Standing at the crowded MRT Station, I kept my eyes on the crowded pack. Would I be able to recognised her? No sight of her after 15 minutes so I sent her a text message. Turned out that her meeting was late and she would be late. Told her to take her time while I went window shopping. 20 minutes later, I received a call from her saying that she had reached. Agreed to meet at Crabtree & Evelyn at Level 1. Standing at the entrance of Crabtree & Evelyn, I finally realised why Bugis was so crowded that day. Alien Huang was holding a performance and autograph session. I concentrated on scanning the crowd for Tallin amidst the screams and cheers of the teenagers. Finally, we saw each other. Despite a long day at work, our face beamed with happiness upon seeing each other. After the usual hello and how are you, we proceeded to look for a decent place to fill our growling stomachs. Dinner time, therefore, most restaurants were packed. Settled on Nanxiang Steamed Bun Restaurant as the queue was the shortest. 10 minutes later and having decided on the menu, we finally got a seat and waited for our food to be served. Xiao long bao with shark fin and crab roe, hot and sour soup, snow peas and a shanghai rice with chicken chop to share. Catching on each other's life, she's happily married and trying for a baby. Complained to each other about the problems we faced at work, both of us are in the civil service. Stomachs filled, bill paid, we decided to do some window shopping. About an hour later, bored with all the window shopping, we decided to find a place to chill and rest our tired feet. Ordered a dessert to share at Shokudo Japanese Coffee House since we were still quite full from the dinner. More catching up and making arrangements for the next meeting. Time passes by when you are happy and before we realized it, it was already 10.30 pm. As I had to meet my colleagues and she was feeling tired as well, we decided to call it a day. Both of us agreed that we never expected that one day, we would be sitting down to have dinner and catch up. Especially when we weren't chummy mates back then. Can't wait for the next meeting.